So 2014 got itself off to a nice start, as I was reminded of one of my favorite things; the deep conversation with a perfect stranger. I woke up early and headed down to Newcastle Beach- this place is honestly stunning and I pinch myself every time I stare over the dramatic landscape that I’ve been lucky enough to call home for the last few weeks. I went for a rog…a run/jog (I just made that up). Which was more like a shuffle but just a way to get myself moving in 2014. 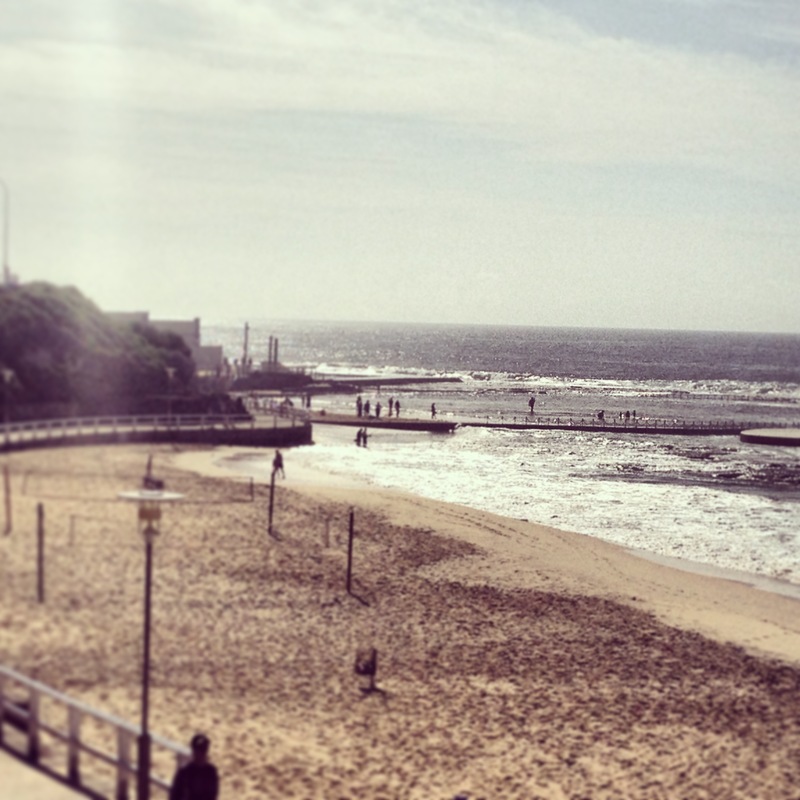 I was more about checking out the awesome scenery around me and exploring, and when I hit the most dramatic part of the landscape and saw a lot of memorial plaques around me, I realized I was standing at the most popular place to commit suicide in Newcastle. (Ya bet you weren’t expecting that now were you). Anyways, after getting my sweat on, I headed back to the beach to one of the cafe’s that look right across the water and started in on one of my goals for 2014: to read more. I was engrossed in a really interesting book on veganism as an athlete (something I may attempt after I finish the moroccan lamb salad that is front of me), when I saw the waitress calling out aimlessly number 11, and noticed the girl that sat next to me had the same number and was clueless to the waitress trying to find her. So after doing my first random act of kindness of 2014, connecting this girl with her food, we started chatting. Turns out she was a solo traveller from Switzerland and we hit a whole bunch of different topics as we chatted away for the good part of an hour. Her name was Sabrina and she was traveling through Australia and New Zealand for 6 months. She was trying to figure out what she wanted to do when she got back since she had had a job for a while. She proceeded to educate me on the system in Switzerland. Apparently for your last two years of high school you can decide whether you want to do academic subjects on the road to university, or you can do an apprenticeship, which she had where you combine classes and a job. After her apprenticeship she landed herself a job with the Swiss Winter Sport Federation, a position she held until she started traveling. I told her about how eye opening it was for me when I got to Denmark at age 22 with a newly finished masters. At an age where most Danes are just starting to head to university after spending the years after high school traveling and figuring out what truly interests them, they thought it was nuts that I was done my masters. That was an interesting coincidence as I thought that they were nuts. The best part of the exchange and the most eye opening thing for me, was the idea that there is more than one way to do things. The more I thought about the Danish way, the more it made sense to me, to take your time to figure out your education and life path and not force 18 year olds into making a decision before they even have half an idea about who they are. The number of friends that I have had that have, that as an example spent $140,000 on schooling to be a lawyer before realizing before age 30 that it’s not what they want to be doing with their lives, reinforces that maybe there are other, better ways to do things, and that (gasp) maybe we don’t have it all figured out in North America. Which brings me back to my new friend Sabrina and why traveling is so awesome, and even being here in Australia, why I feel so fortunate: it brings you information- you learn more about the world, about the different ideas that are out there and you learn to do things deliberately with the concept that there are choices, instead of being like a herd of cattle just doing what everyone else around you is doing and not really thinking about why. It was also a great reminder it is for me, about getting out of my comfort zone and striking up conversations with people, something that I can be kind of awkward with at times and hence avoid. Meeting and talking with interesting people and gaining more insight into the world is one of the easiest gifts we can give ourselves. Add that to the list of things to improve upon in 2014! 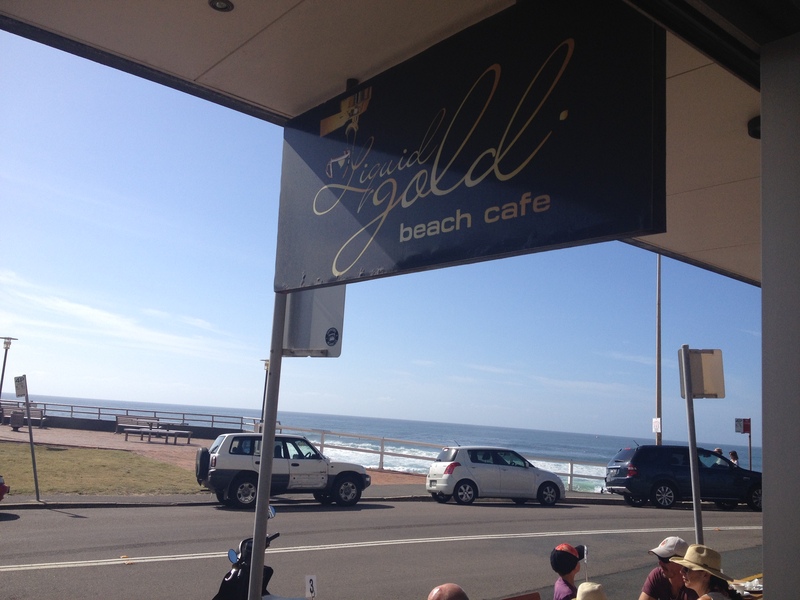 The view of Newcastle Beach from the cafe where my friend Sabrina from Switzerland and I chatted it up.